This Painting by Ted Jones (Irish 1952-2017) is a wonderful oil on canvas depicting an Irish emigrant at Surbiton Station, London. 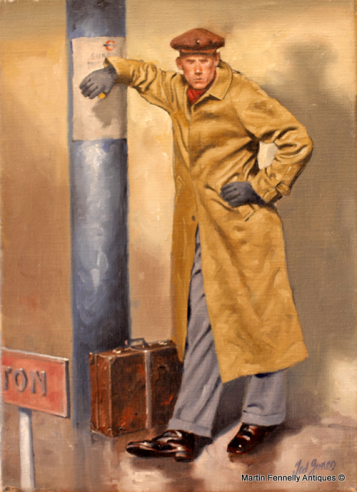 Ted Jones is famous for his emotionally charged portraits of emigrants which capture the moment in a subtle yet thought provoking and indeed romantic way. This painting is captivating and exhibits Ted Jones work at its best in the 1990's. The Painting is framed, signed lower right. This Painting has an excellent provenance and was purchased directly from the Artist in the early 1990's which many believe was when Ted Jones produced his very best paintings.